This was a book that I couldn’t resist after reading so much great feedback from other book bloggers. Jenny Han was a new author to me, and I’m glad that I was introduced to her work. To All The Boys I’ve Loved Before is a young adult fiction novel that follows Lara Jean Song, a high school-aged middle child. Her older sister Margot just broke up with her boyfriend Josh and is studying abroad in Scotland. Her younger sister Kitty is obsessed with convincing their dad to get her a puppy. And Lara Jean finds herself in the most mortifying of predicaments. It turns out that her habit of writing love letters to the boys she was once in love with has epically backfired, because somehow the letters get mailed. And one of those boys just happens to be Josh. To save face, Lara Jean impulsively decides to pretend to date her old middle school crush, Peter Kavinsky, who also received a letter. Peter agrees to fake-date her to make his ex-girlfriend jealous, which adds even more drama because nobody crosses the queen bee and gets away with it. This was a great audiobook, because Han imitates a teen girl very well with her short, simple sentences and conversational tone. However, as much as I loved the fact that Lara Jean was half-Korean (seriously, why aren’t there more protagonists of color in literature?! ), you could obviously tell that the narrator was unfamiliar with certain terms, like incorrectly pronouncing the Japanese manga that she reads as “main-gah” instead of “mahn-gah.” A small quibble, but I couldn’t help but cringe during these moments. Other than that, I enjoyed this story because it was so relatable. Lara Jean, inexperienced in relationships, must learn to adapt when her once-unrequited loves start to show interest in her. She must also navigate her changing family life, dealing with her older sister so far away from home. With their father raising three girls alone after their mother’s death, Lara Jean has to step up to be a role model to her younger sister. I was a bit disappointed by the conclusion, since the story took too many turns toward the end that I couldn’t predict where it would stop. Once it did, I felt that I would have outlined it differently. However, I learned that Han has a final sequel planned for April 2015 called PS: I Still Love You, so hopefully the plot comes together better in the second half. 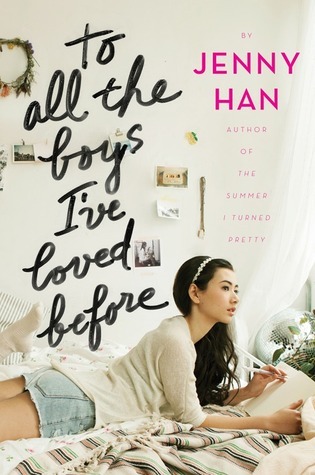 To All The Boys I’ve Loved Before is a fun, lighthearted read that will make you empathize with your teen self and nostalgic for your own coming of age. This entry was posted in Audiobook Review and tagged audiobook, book review, chick-lit, Jenny Han, romance, To All The Boys I've Loved Before, Young-adult fiction by Book Club Babe. Bookmark the permalink. Check out the novel, “Blue Castle.” I think you’ll enjoy it! Who’s the author? I’ll check it out!